At times, the most minor difference can make a tremendous impact; something that may not seem obvious but leaves a tip of the tongue realization. A new restaurant has opened near me and has grown on me quite a bit, but it is easy to know why. It is a seemingly small difference, however it shows that the itamae has an understanding of sushi that is often lacking in many sushi-ya. A good sushi restaurant is made not just by the freshness or the fish, or the value of the offerings, but also the little things that illustrate the care and understanding of those who provide your meal. Sushi has always been about more than how fresh the fish is, how it is presented, the attentiveness of the wait staff, etc. But often people miss out on the actual creation of the food items. I’m obsessed with food and tend to be nosy. I am not at all uncomfortable wandering over to the itamae to watch the food preparation and discuss technique. I stare, I study, and I ponder (and silently critique). But I’m friendly and at least so far, no one has shooed me away. One particular thing I have noticed is the preparation of maki (cut rolls). A smart restaurant will do it’s best to reduce waste without sacrificing quality. For this reason, it is a very common practice at Japanese restaurants to prepare blocks of maguro (tuna) for sushi and sashimi, and they scrape and chop the trimmings for use in certain rolls. No one really notices that this is the cast offs and remainders that are being used as they are often mixed with spicy mayonnaise or panko (crunchy Japanese bread crumbs) and rolled up. It makes sense to not waste the meat, and I do not begrudge anyone for doing this. Here comes the “but.” For me, food is about more than taste and presentation. Food is also about texture. I enjoy the feel of different food items, and when I eat a roll, I enjoy the feel of the meat in the roll. I eat a fair quantity of hamachi (yellowtail). Hamachi maki finds its way onto my plate at almost every sushi meal, and more often that not, it has been macerated prior to inclusion in the roll. To me, it becomes one big mushy pile, no matter how nice it may taste. I greatly value the practice of cutting a piece of hamachi and leaving it intact in the roll, which provides definition and a sense of variety while I eat. There are times when I specifically ask the itamae to leave the fish whole in a roll, it is that important to me (ok, I’m more than just a wasabi snob). Without this contrast, I do not find maki nearly as interesting. While I believe the practice of including the trimmings in rolls should continue, as it reduces waste, I appreciate the itamae who takes the extra step and realizes that the texture of the meal is as important as quality and presentation. With many sushi chefs having less and less formal training these days, I feel that this perspective is becoming lost. Sushi is more than food, it is art. It is not black and white photography; it is full color, vibrant and nuanced. I do not walk in to a Japanese restaurant and start issuing commands, I am a polite diner, and while I may make my wishes gently known, I can appreciate when a chef has the presence of mind to understand the importance of his work. It is a very small gesture, but one with great ramifications. At least, great ramifications for me. I was wondering if you’ve ever lived in Japan? I just wanted to comment on something you wrote about a while go regarding venison sushi. You seem to think this is not “traditional sushi” when in reality restaurants in Japan serve all kinds of “sashimi” that are not fishmeat. For example, one of the most popular nonfish sashimi is horse meat, and less popular (because it’s so rare) is raw chicken sashimi which I had in a Sapporo izakaya. Furthermore, whale is also the underground favorite and if one didn’t know better it looks like raw steak (but tastes like fish). Also, sushi styles widely vary in Japan depending on the region. I used to live in Hokkaido, a place I which I personally think has the best sushi in the world. In Tokyo I think the sushi is disgusting and overpriced-even in Tsukiji. Also, there are many kinds of sushi you cannot get in Tokyo that is served in Sapporo like mame fugu (baby fugu) and chan-chan yaki (salmon with a sweet miso paste). Furthermore, places in Tokyo have this annoying habit of putting mayonnaise on aburi-salmon. Hi Jinsei, what I mean when I’m talking about “traditional” sushi is exactly that. Most sushi-ya these days anywhere are not “traditional” in the sense that they keep to the rigid sushi traditions of old. In fact, those types of restaurants seem to be few and far between. 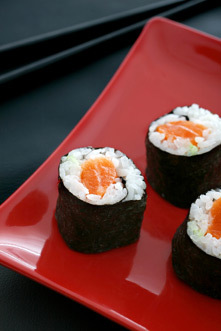 One can absolutely find all the foods you mention in many sushi-ya and the western world has done a very good job of exporting techniques such as adding mayonnaise to various dishes, which is about as far from traditional Japanese cuisine as you can get. I don’t mean to disparage any restaurants, I enjoy most of the dishes I find in any sushi-ya, and other types of meat are becoming more and more common. Change is the nature of things, and I only sought to differentiate between what is ‘traditional’ and what is not, not imply that any one is better than the other. I hope that cleared up my position. Thank you for replying. I understand your position and actually I agree that so many types of sushi that American places serve are not very good, nor traditional in any sense. Even in Tokyo, When I once ordered aburi salmon, it came with mayo on top, which I found disgusting and couldn’t understand why they would do that other than for Japanese people’s obsession with mayo as of late. Although, outside of Tokyo they never put mayo on any sushi. Just curious though; do you live in Japan? If so, have you eaten in Otaru, Hokkaido? Born and raised in Japan, I expect to see the same Nigiri items at any sushi restaurants in Japan. From Maguro, Ika, Ikura to Uni, just about every sushi restaurant serves the same items and people are content with the same old tradition or at least they don’t ask for anything other than what they are used to see. What you enjoy is a subtlety your pallet distinguishes after all. A skillful chef at a established sushi restaurant can provide that. Having lived in Portland, Oregon for over years, I saw how people embrased sushi and raised its status from “raw fish” to “delicacy” over time. What I find most amusing is the American ingenuity. My favorite sushi restaurant in Portland serves Nigiri with seared salmon, octopus salad, deep fried sushi, or even a thin slice of roast beef to name a few. I quickly became a big fan of this new invention. When I was visiting Tokyo last year, I found myself missing these American sushi. People back in Japan don’t know what they are missing.